The last post is sounded for annoying “HUMMMM” sound in Europe. 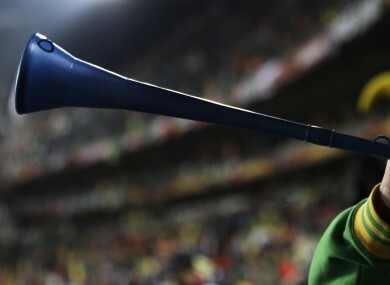 UEFA HAS TODAY banned vuvuzelas from all grounds hosting matches in this year’s Champions League and Euro 2012. The governing body for soccer in Europe called the instruments “not appropriate in Europe”, telling all fifty-three member associations to enforce the ban at all their matches. “In the specific context of South Africa, the vuvuzela adds a touch of local flavour and folklore,” UEFA said, before adding that they would change the traditional atmosphere at European matches. Fifa refused to ban the instruments during the World Cup in South Africa, despite protests from broadcasters and fans worldwide. Email “Uefa ban vuvuzelas from European matches”. Feedback on “Uefa ban vuvuzelas from European matches”.